When we decided to rv full time we sort of plunged in without doing our research. 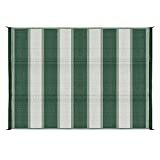 Therefore, we hadn't learned the importance of purchasing some must have camper accessories, such as an RV Patio Mat. After learning that you simply need the area under the camper awning to be covered, period, we also learned that all RV awning mats are not the same. 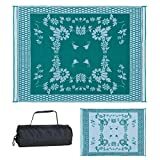 Of course they vary aesthetically, with beautiful designs, colors and patterns to choose from (or plain, if you prefer!). But what is really important is that they are are REVERSIBLE, like all of the selections you will see in this article. Our decision to sell it all and hit the road in a travel trailer full time wasn't years in the making...in fact, it was less than a year in the making! Of course, because we didn't have a lot of time to plan, we had to learn everything the hard way (and we still do!). The photo you see above was of our first semi-permanent stop, after we embarked on our journey. Our stay here lasted for a little over two months. We laugh at ourselves now, looking at our desperate version of an outdoor RV mat. Look at the photo and note the green tarp inside the screen tent...and the blue tarps laid out in front of our travel trailer door. There was a lot of soggy, muddy grass we hadn't thought about, because we were too busy learning how to operate the inside of our trailer. But our attention was diverted quickly after a few good rains. With the muddy paws of the dogs and our shoes coming and going all day, we were going crazy trying to keep the inside clean. So of course, we grabbed the tarps. Problem solved???? Um, no. We are positive you experienced fulltimers are already shaking your heads and knowing what happened next....that tarp in the photo was about as helpful as placing a child's swimming pool in front of our door. Where did we THINK the water would go?? So that was our first hard lesson - you see, a modern, reversible awning mat is designed to be breathable, so water and debris pass through and you're not growing mold and mildew underneath, nor starting your own lake outside of the front door. You can imagine that after the first six months of our adventure, we were going through tarps like toilet paper because of the mildew that would form underneath them. In addition, our carpet was starting to look horrific from tracking in everything our tarps had collected along the way. We laughed, looking at our carpet as a "little journal of everywhere we had been to date," because it had a "little bit of everything" embedded in it! 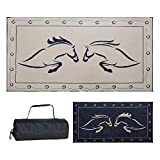 The most important reason to have one of these mats is to keep the rv clean...but they are also aesthetically pleasing with designs to fit the unique personalities of rvers everywhere. We hope you will enjoy browsing through the range of fashionable patterns below. 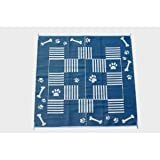 This article is here to explain the benefits of these reversible patio mats and to show you many of the fun varieties and colors to choose from. Hope you enjoy it! 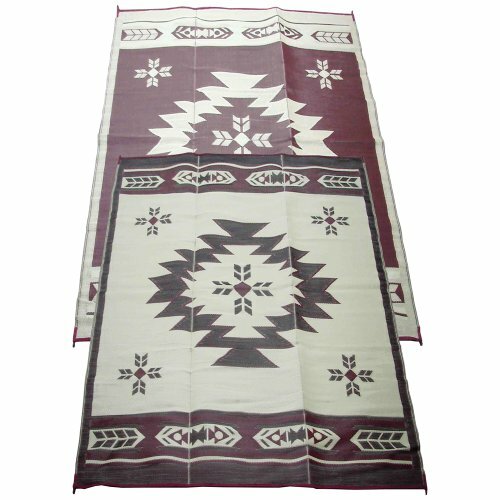 These patio mats have durable, woven designs that allow dirt, debris and rain to sift right through it. This, in turn, helps keep your RV clean on the inside because outside elements won't be tracked in (your carpets won't look like mine did!). Another added bonus is that, being breathable, these mats will not damage the grass underneath them. Simply shake or sweep your mat, then hose or wipe off. They are also breathable and, therefore, mildew resistant. Most importantly, they dry quickly. The heavy outdoor grass mats that used to be very popular would get embedded with dirt and pet hair, were hard to clean and took eternity to dry, which made pulling out of a site on a rainy day extremely challenging. You no longer have to worry about the weather and can leave it out until you are ready to leave your site. 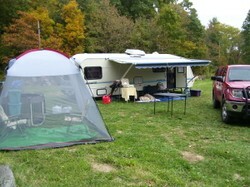 Portability and weight are very important to the RV lifestyle. 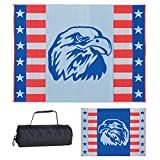 These awning mats are perfectly suited for the RVer, because they weigh so little (no more than 12 pounds) and are compact (averaging 36" x 12" x 6"). 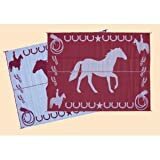 It is often difficult to find room to store an awning mat but these more modern rv mats alleviate that problem. This makes them easy to "grab and go" for other events as well. Perhaps it is in front of your RV most days, but if you are having a picnic, going to the beach...well, just grab your mat! 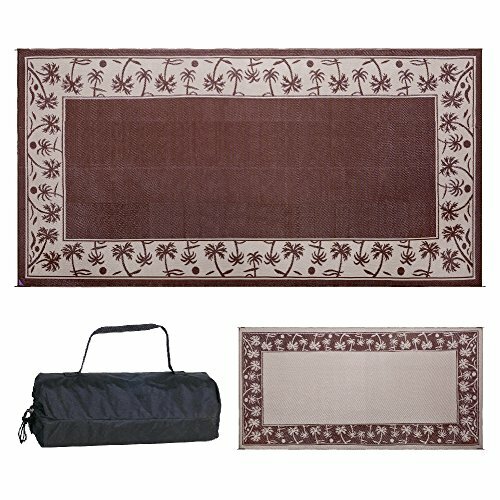 Made of durable polypropylene and given their woven design, these rv mats are built to last. They are secured at the corners with ground stakes. They have UV protection built in to reduce the risk of fading. 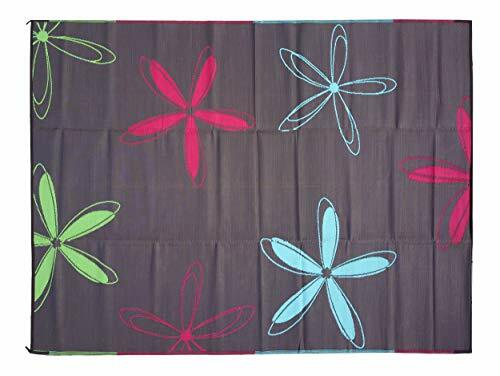 Being reversible, the life of your awning mat will increase as well. Our Current Wildlife Themed RV Mat - We Love It! 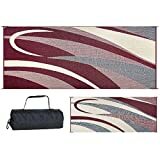 Please keep in mind that the following is a sample of the beautiful outdoor mats available for your camper. Most of the ones shown are also available in various colors (especially pattern designs), shapes and sizes! It would be impossible to show all variables here, so please keep that in mind! The rving or camping mats you have viewed in this article are of good quality and a very important accessory to keeping your camper clean. That said, they are not magic carpets...common sense and reasonable expectations are the keys to satisfaction with your purchase. If you receive two feet of snow, no matter how grand the woven designs are, we guarantee it will not simply disappear through the weave like magic. If you are in a flood zone and the ground is saturated, you will be walking in water. Their longevity will depend on how often you use them and how many feet (and paws) they will endure. If one should wear out over time or if you simply desire a fresher look, replacing it more often than necessary, the used ones can simply be "retired." 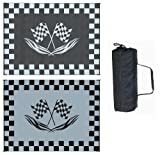 They are very durable and can still serve you well in another area of your RV site, such as under a screen tent, picnic table or on the other side of your RV. They can also be easily stored for an outing at the beach, picnic or tent camping trip. If you found a pattern you liked today, one last tip - measure the area you wish to cover under your awning! There are very large ones available, too...if you want a lot of depth and width coverage. That part is up to you! Then just put up some cute rv awning lights and you are good to go! 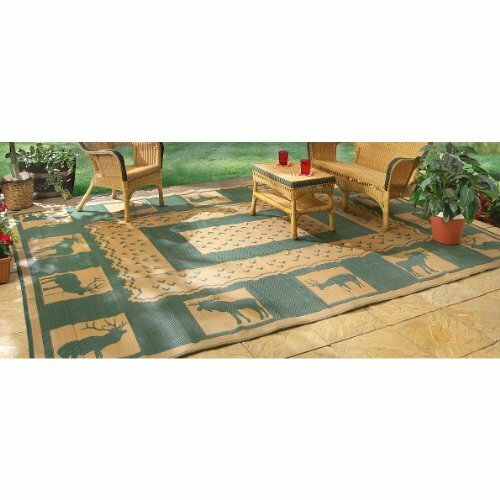 frugalrvers, The reversible mats and your wildlife-themed mat are attractive. Do you have one that you use or do you have several to vary the ground cover with? You mention that "It is often difficult to find room to store an awning mat but these more modern rv mats alleviate that problem." Do they fold up easy into cabinet or closet space?